Yearly march around the walls of Jerusalem's Old City takes place - this year without restrictions; calls for Jewish prayer on Temple Mount. 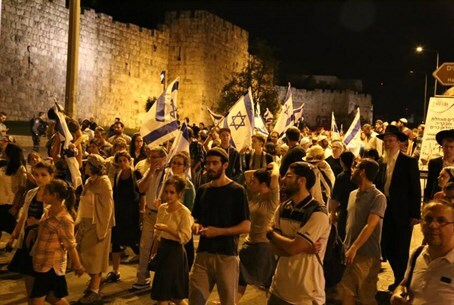 Last night, the evening of the fast of Tisha b’Av, thousands of participants carrying Israeli flags walked around the walls of Jerusalem calling for application and enforcement of Israeli sovereignty. Organizers promoted the event "a rectification for the historical sin of the spies," the sin that according to tradition was one of the causes of the destruction of the Temple, and a series of disasters over the generations. The many thousands of participants came from all areas throughout Israel, for the march around the walls of the Old City of Jerusalem, organized by Women in Green, for the 21st consecutive year. The event began with a reading of the Scroll of Lamentations in Gan Ha’Atzma’ut (Independence Park), which is in the center of the capital, and the walk around the walls of the Old City began immediately afterward, with the many participants holding Israeli flags. Historian Aryeh Klein accompanied the walk with words of historical explanation about sites relating to events from the Crusader era until the Six Day War that were by passed during the walk. At the Lion’s Gate marchers gathered for concluding words and speeches by Deputy Minister of Defense Rabbi Eli Ben Dahan (Jewish Home), MK Bezalel Smotrich (Jewish Home), Prof. Aryeh Eldad and Rabbi Yosef Mendelevich. Before the speeches by these public figures, the heads of Women in Green, Yehudit Katsover and Nadia Matar, called on the authorities to bring an end to the lawlessness in parts of the capital, as well as in Judea and Samaria. "The principal sin that we must rectify is the sin of the spies – contempt for the goodly Land. We must not only lie on the floor and and lament tearfully, but rectify the root of the reason for the destruction in a practical way, to settle the good Land, to cling to it, to apply our sovereignty, to enforce our sovereignty and to have faith in the Almighty who gave us the power to conquer the Land," Matar said. "Realization of sovereignty by the government of Israel with a continuous push for consciousness has its results. The prime minister acted correctly in the Iranian matter. He should act with the same determination and persistence in the matters of building, development, flourishing in all areas of the Land of Israel. "Neither Obama nor the High Court, which is pushing these days for the destruction of dozens of homes in Beit El, will dictate the borders to the People of Israel and therefore we strongly protest and encourage all of our friends who are organizing for the determined and uncompromising battle in the sector. "It is the Bible that will dictate to the People of Israel, the promise that the Almighty gave to our fathers, and we must fast for this and connect with all of the generations. Remembering the past and building the future. ‘Let us go up and take possession of the Land, for we are well able to overcome it’." After these words, Deputy Minister of Defense, MK Rav Eli Ben Dahan spoke. He too invoked the Biblical story of the sin of the spies, who the Torah says brought tragedy upon the Jewish people by spurning the Holy Land. "The spies thought that it was better to remain in an ideal world, a world of inaction, where manna waited at the tent opening and water from Miriam’s well came to you, without any effort." Ben-Dahan said. "But in order to enter the Land of Israel it would be necessary to labor and to be connected to every clod of land. We do not live by miracles, but by deeds and activity. The more we build in all areas of the Land of Israel, the more we will connect and commune with the Land." He also noted that during his relatively short term in the last Knesset as Deputy Minister of Religions, he prepared regulations for Jewish prayer on the Temple Mount. Today, Jews are forbidden from praying there due to Muslim threats, despite it being the holiest site in Judaism. "Particularly on this day we demand that these regulations be approved. We expect the prime minister and the government to approve organized Jewish prayer on the Temple Mount. I cannot be that every people can pray at this place and only the Jews are not permitted to pray there." After Rabbi Ben Dahan’s words, former MK Prof. Aryeh Eldad spoke, lamenting the government's lack of resolve in dealing with Arab violence in the capital, and particularly on the Temple Mount. "We did not expel the rioting Arabs from the Mount, we did not establish the communities that we destroyed ten years ago," he said, referring to the 2005 expulsion of Jews from Gaza and parts of northern Samaria. "The State of Israel surrenders its sovereignty on the Temple Mount and abandons it to a foreign state," Eldad said, further noting that the State of Israel had not completed the one access bridge for non-Muslims to the Temple Mount, since it had granted to Jordan the privilege to decide what will be built on the Mount and what will not be built there. During his speech, Prof. Eldad noted the historical findings in which national figureheads who had persecuted Israel have stated as absolute fact that there was no longer a People of Israel, but today, while nothing remains of them but historical remnants, the People of Israel lives on. Eldad stated that just as these predictions were disproved, other, early predictions will also be disproved – the People of Israel will establish settlements that it himself destroyed a decade ago, and this is also how the Third Temple will be built, and sooner than we think. "We demand that the government of Israel allow Jews to pray and to lay the cornerstone of the Third Temple," concluded Prof. Eldad. The third person to speak at the gathering was MK Bezalel Smotrich, who raised the apparent difficulty to experience the pain of the destruction in the generation of revival, when it is possible "to walk around the walls of Jerusalem en masse with Israeli flags, accompanied by our police, in our state, in our Land, and on the other hand, to look upon the walls and inside to the Temple Mount and remember what is happening there." "It would be easier to experience the sorrow of this day in the diaspora," said Smotrich. But he added: "From a certain point of view, perhaps it is easier for us today to feel the pain of this day, because we are closer and therefore feel the lack. A Jew in the diaspora could not have imagined what we have now. It is difficult to imagine something that one does is not familiar with. When one is close, one feels the lack." "I call on the prime minister: you can decide whether to be among those leaders who perhaps now are a majority but in the end, nothing will be remembered of them, or you can be among the leaders of the minority, who raise the banner to the top of the flag post, and who are among those who are remembered. "Prayer in the Temple Mount is the minimum. We have a commandment to build the Temple. The Almighty has done his part and has liberated for us the place with tremendous miracles. Now it is in our hands. And as everyone aspires to fulfill the 613 commandments, we must also fulfill this commandment." The gathering was concluded with the words of Rabbi Yosef Mendelevich, a former prisoner of Zion and one of the lead activists for the liberation of Jonathan Pollard. As in every year, Rabbi Mendelevich read the special prayer written by former Sephardic Chief Rabbi Mordechai Eliyahu for the liberation of Pollard and stated that if indeed Pollard will be freed in the coming days and weeks, then Israeli society must beg his pardon for not doing enough to free him. "We did not do what we had to do. We went astray in the battle for Jonathan because all of the efforts were in beseeching the government of Israel to speak with the government of the United States. The battle should have been waged in the United States. As the People of Israel we must fight and understand from experience of the past that only demonstrations that are bothersome, and not comfortable, for the government, have an effect." Rabbi Mendelevich concluded his words with a call to the Jews of the United States: "We will get by, but the call is to you. Go out into the streets in your thousands, in tens of thousands, to defend our People, our Land and yourselves. This is your duty."